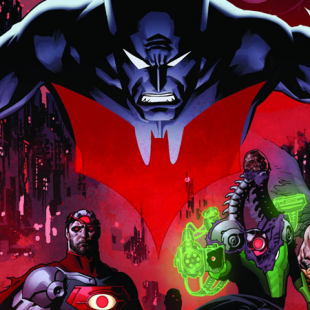 DC has released details giving fans a peek of what to expect in the upcoming Future's End storyline. DC's new limited series Future's End will open with an arguably humble opening shot next month, launching in a special 0 issue that will be distributed as a part of Free Comic Book Day. That being the case, the series is looking as though it will be nothing short of gigantic, involving a massive portions of the publisher's New 52 books in a storyline that will take months to resolve and shoot readers five years forward in the DC Universe's current continuity. DC fans, in turn, have understandably been eager to learn more about what will their favorite heroes and villains are in for in the story. The answer, at least according to some recently revealed September 2014 solicitations, would seem to include no shortage of death and "dark," "extreme" content. On the death side of things, it looks as though the Teen Titans are destined to meet their end so they can be replaced by "a new group of young heroes." Green Arrow is apparently also going to meet his maker with a similar replacement planned. Not all the doom and gloom will be restricted to the dead and dying however, Wonder Woman's recent turn toward godhood will apparently be taking a dark turn during the Future's End saga as she "embraces her true nature as the God of War to battle the armies of Nemesis" and, in turn, "[spells] doom for humanity." There will apparently also be a new "darker Superman prowling the streets of Metropolis" with a mysterious identity as well as a Batman who has taken to "using dangerous science to help him continue his war on crime." Perhaps providing a counterbalance to all of these black tidings will be a few marriages. Harley Quinn and the Joker, for instance... Well, that probably won't end well. But you know what what? At least we can look forward to Supergirl reconciling with her father! Oh, she does it "in the most horrific way possible." Well, that doesn't sound good! Tell you what, take a look at the list for yourself and let us know what looks interesting to you.